This is rather an unusual 1st foot or Grenadier officers shako plate of c1822 in as much as the colours are reversed. Normal colour pattern would be that the a gold coat of arms mounted on a silver 8 pointed star. Apparently this reversal of colours has occured a few times and there is also one with reversed colours in the Grenadier museum which belonged to the Duke of Wellington. Rather a pity someone decided to change it into a pinned brooch cutting the original posts to the rear. Brian - this is a lovely example - and personally, it wouldn't worry me that it had a brooch conversion. I am a little curious about the silver coat of arms - the look in the photo is almost a pewter colour. This would be unusual as I would expect silver - perhaps it it the mellowing of the silver with age ? What do you think ? ps. Sorry to query your 1822 date - I would have thought more the Crown shape for William 4th. (1830-37) - certainly a little more angular then most Georgian ones. I'm not being 'picky' - just interested regarding a lovely old item ? Hi Mervyn, Thanks for your posting. You had me a little worried at the beginning when you said it looked a pewter colour..... Immediately thought is it a fake? I then took the plate apart and found that it is a silver ( just tarnished a little ), so I buffed it up a little and it looks great. Mind you I don't know if I should be doing that ! I have checked in in Kiplings book on headress badges, but stangely no meantion is made of the 1st foot. It starts with the 2nd foot. 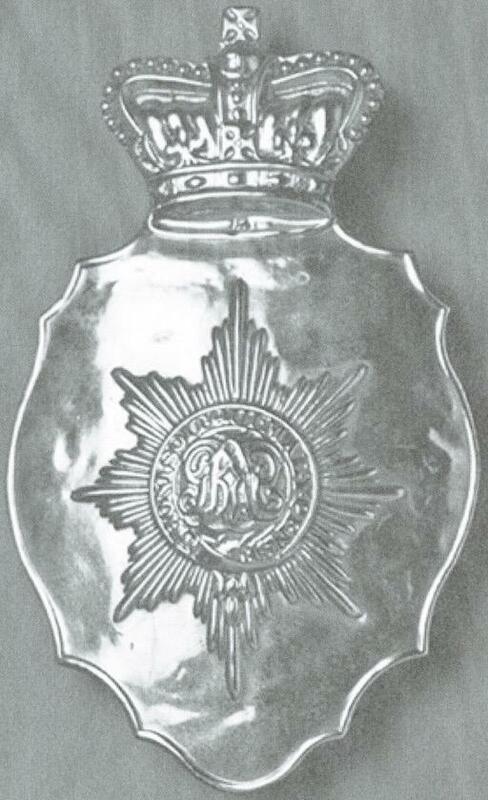 I then looked at my copy of the British Military Shako1800-97 by Bryan Fosten and found the plate on page 26. It was only issued between 1822-29. So I guess that the crown could not be William 4th. I believe the reversed metals are for OR's. PS: Apparently this distinction was formerly confirmed by William IV in 1830, although it may well have been in practice much earlier. 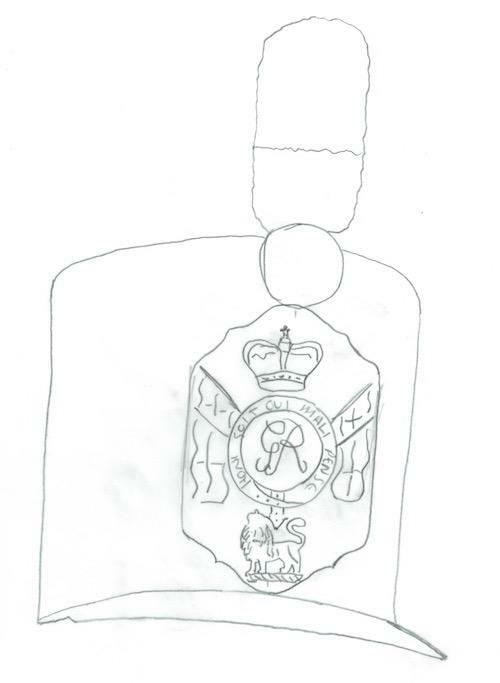 Here is the HAC Officer's badge. PS: Will post my images ASAP … as soon as I can find them. Sorry I have not found the HAC plate yet, but here is the D of W badge referred to earlier : As you can see, it is not quite the same design as Brian's badge (disregarding the reversed metals) , but this could simply be a manufacturer's difference. The only other reasons I can think of to explain the reversed metals is, either a 1st & 2nd Battn difference/distinction (? 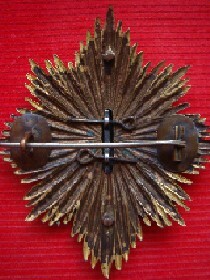 ), or perhaps "Gentlemen at Arms" badge. I don't believe the reversed metals represents different Battalions. Or I've never heard of that before. Quote : " I don't believe the reversed metals represents different Battalions. Or I've never heard of that before"
Not nowadays of course. But years ago these differences took on much more significance than they do today. 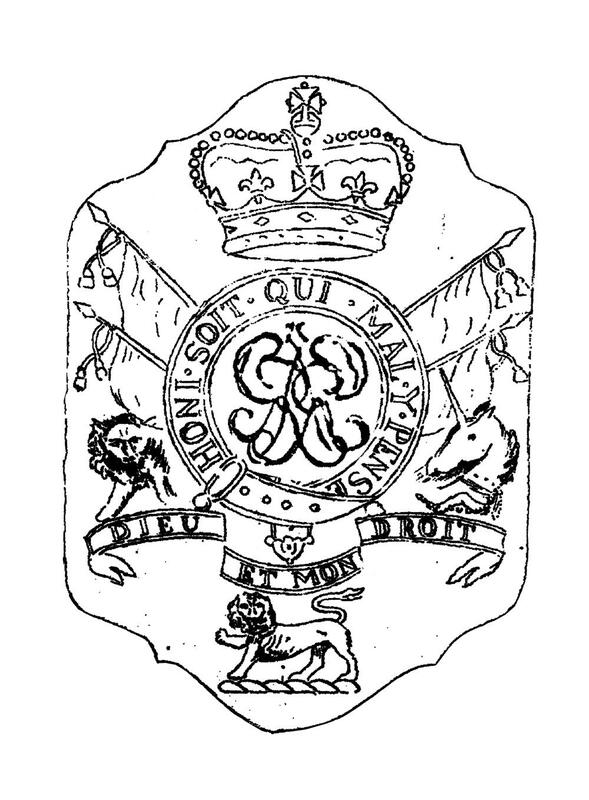 eg; According to Chichester & Burges-Short, the reversed and interlaced Royal Cypher was the prerogative of the 2nd & 3rd Battalions Grenadier Guards, and the Honour "Waterloo" was also, strictly speaking, only awarded to the 2nd & 3rd Battalions. 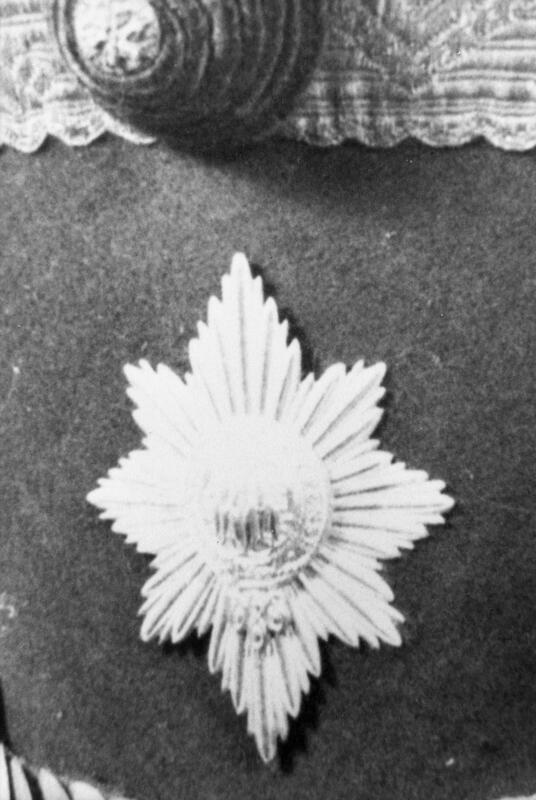 I must confess, I do not know if or how these distinctions were reflected in their badges at the time, but certainly with respect to the Coldstream Guards, there are shako badges of the same period with and without the "Peninsula" honour, possibly reflecting the 1st & 2nd Battalions ? Such distinctions even carried onto different Companies of the same Regiment, ie; The 1829-44 shako plates of the Light Coy 61st Foot carry the honour "Maida" while those of the Battalion Coys do not. Similarly,for the same period, with the 40th Foot; Both of the Flank Coy badges carry the Sphinx & Egypt honour, while the Battalion Coys do not. This is also reflected in their SBPs. Very interesting Jeff, I've not got those books regarding badges. Do they say where this info has come from regarding the Royal Cypher ? The earlier shako badges are these. The other Jeff, both with the Royal Cypher. Thanks for your reply and the interesting pictures. 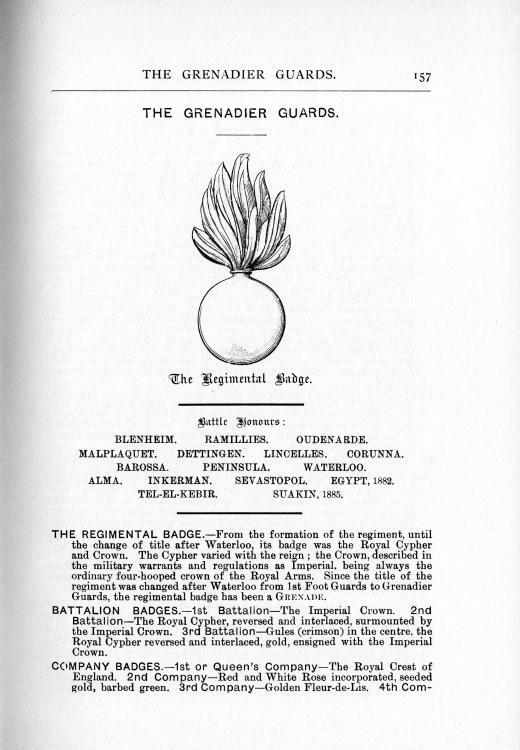 In return, here is a copy of the page to which I referred ; it is taken from "Records & badges of the British Army" by Chichester & Burges-Short, Pub Gale & Polden 1900. My other reference was "Battle Honours of the British Army" by C.B.Norman Pub John Murray 1911. Both have been recently reprinted and I guess are probably obtainable from Amazon, but I would NOT recommend them to badge collectors as they are rather large Tomes and the information they contain is mostly historical and nothing to do with badges. Thanks Jeff, very interesting. 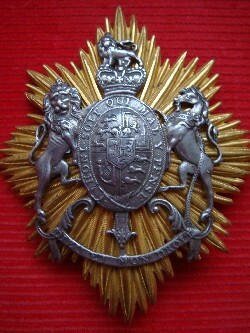 The Regimental Badge is still the The Royal Garter surmounted by a Crown with the Royal Cypher in the centre, and the Grenade is still the secondary badge. It says Battalion badges and Company badges ? 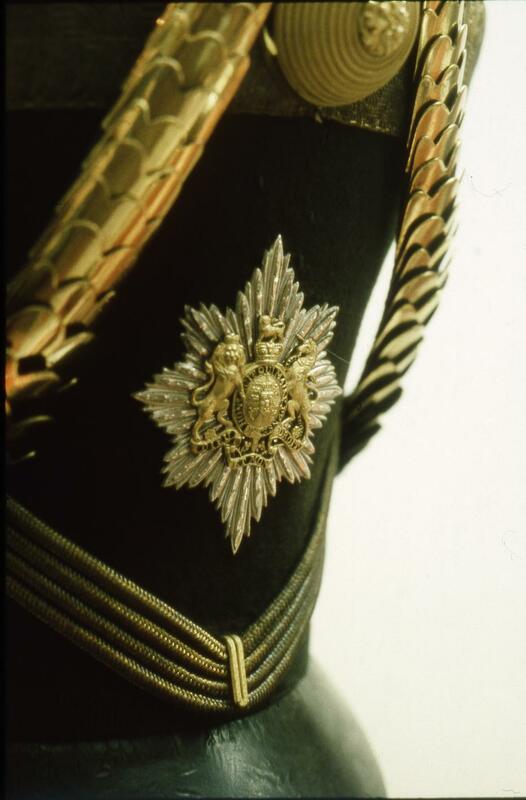 I believe this should be Battalion Colours and Company Colours.The 3rd image, could this be Coldstream Guards ? as it's not the coat of arms on the eight pointed star ? I'm still a firm believer that the reversed metals are for other ranks, but even this would be hard to prove. Especially to this era. The third one though to be honest i couldn't be 100%. I had chance to buy the Regency Shako badge about a year ago ( it was all agreed ) but i got shafted with it. The Military Gentleman, most definitely no gentleman ! Ex Forces too ? Thanks for your reply. I get your point re the "badges" but of course these do confirm the protocol. Re my 3rd image, this is definitely 1st Guards … not too clear I admit, but if you look closely, one can just make out the reversed and entwined cypher. 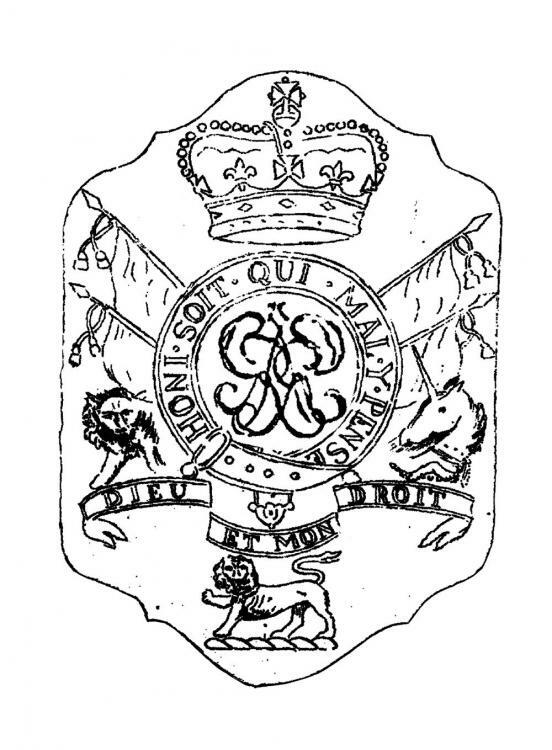 I would guess this dates the badge as circa 1816 - 1820, after which the Royal Arms badge we are discussing followed. No problem : I guess a few people will have copied them already. You are all very welcome. PS: I have had dealings with Garry Gibbs, please give him my regards. Thank you Jeff, i always believe its best to ask first. I'll mention you when i speak to Gary. I don't know why i questioned that badge ? its the centre piece of the badge, on my first image i sent you ? Thanks again Jeff. Any news from Gary Gibbs yet ? Have you by any chance sold this badge recently ? Not yet Jeff, i'm going down in January hopefully. Thanks for your reply. The reason I asked is because a very similar badge (possibly the same one) was offered at the Bosley sale of 5th July 2017 Lot 151. The badge was described as : "Georgian Officer's Regency shako plate attributed to Staff …." It was reversed metals and had a pin-back replacement, and the Unicorn was missing its horn, just as Brian's item. I feel sure this is the same badge. What evidence supports this view was not given. Possibly Hamilton ?